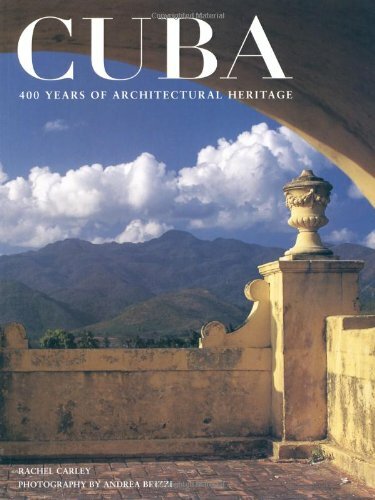 Exquisite, rare photographs and timely, illuminating commentary reveal a rich architectural history waiting to be rediscovered as travel to Cuba burgeons among Canadian, European, and Latin American tourists and gradually becomes more accessible to visitors from the United States as well. The lucid, intelligent text and superb photographs shot exclusively for this book present the architectural treasures of the entire island, from the first India bohíos, early colonial structures, and Mudéjar craftsmanship to baroque churches, classically inspired civic buildings, ambitious modernist designs, and present-day preservation work. Now in this practical paperback edition, this unique reference source will be valued by architects, preservationists, historians, students, and armchair and actual travelers. Rachel Carley, the author of A Visual Dictionary of American Domestic Architecture, The Backyard Book, and a former member of the New York City Landmarks Preservation Commission, lives in New York. Andrea Brizzi, who has photographed in more than fifty countries, is based in New York.